The decision to give back the 2009-2011 awards was detailed in a letter this week from VWA chief Michael Horn. Volkswagen has decided to return Ward’s 10 Best Engines awards received in 2009, 2010 and 2011 for its 2.0L TDI diesel, the engine that has put the automaker under fire around the globe for its rigged emissions-testing system. VW is in the process of recalling some 11 million vehicles equipped with diesel engines after it was discovered the automaker manipulated the software in the electronic control units to deactivate emissions systems other than when the cars were being tested. The result is the engines perform better in real-world driving, producing higher horsepower and fuel economy, but release toxic emissions well above regulated levels. The revelation the German automaker was cheating on its emissions certification has forced CEO Martin Winterkorn to resign, sparked investigations in Germany, the U.S. and elsewhere around the world and launched a reorganization of the company’s reporting structure. WardsAuto was notified of the decision to give back the trophies in a letter this week from Volkswagen of America President and CEO Michael Horn. “In light of the recent action by EPA concerning our 2.0L TDI vehicles and associated allegations, out of respect for you and your esteemed publication, we feel it best at this time to return the 10 Best Engines awards that you gave to us for our TDI engine in 2009 to 2011,” Horn says in the letter. 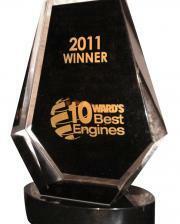 WardsAuto earlier reported it would disqualify Volkswagen, Audi and all other group brands from participating in the 2016 10 Best Engines awards, judging for which is now under way, and all future competitions until investigations are completed and it is evident that actions have been taken to ensure events that led to the scandal won’t be repeated. Typically, VW Group brands other than Audi and Volkswagen are not tested as part of the 10 Best Engines awards because their vehicles are priced above our $61,000 cap or are not sold in the U.S.